It was dark. He had no idea how long he had been running for. Stopping to lean against a thick tree trunk, he saw him. A lone wolf. Breath taking and magnificent. 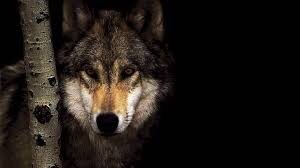 Silent moments passed as they regarded each other until the wail of police sirens permeated the cold air, and the wolf took off. He began to follow. Where ever the wolf was headed, it was preferable to the hell he had left behind.